The most wedding friendly beach on the Gulf Coast is Pensacola Beach. With so much open beach it beats the competition by far. What do I mean by that? More beach without buildings and easy to get to. Did you know Pensacola and Pensacola Beach are two separate areas? Pensacola Beach is located on Santa Rosa Island which is one of the barrier islands that line the coast of Florida. Pensacola is on the mainland. You will need a Florida marriage license to get married in the state of Florida. Visit the marriage license page for more information. You cannot take a marriage license across state lines and use it in another state. Pensacola Beach was voted the #1 beach in Florida by the USA Today readers for 2018. Gulf Islands National Seashore was voted #3 and borders Pensacola Beach. Navarre Beach was voted #4 and it border Gulf Islands National Seashore. That is about 30 miles of some of the most beautiful beaches in the world and this area has more open beach without buildings. Who wants a building behind them when they are getting married on the beach. There are many public access areas with plenty of parking. There is a 7 mile stretch of beach between Pensacola Beach and Navarre called the National Seashore. If you want to have your wedding in the National Seashore there is a fee of $50. Click on the following to your Pensacola Beach wedding packages. If you would like to walk on the beach and look for shells the area between Pensacola Beach and Navarre has a wide variety of seashells from the Gulf of Mexico. The water is so clear you will see many seashells easily. Your Navarre beach wedding will be one you will remember for a long time. It is the best kept secret on the Emerald Coast. Stay at one of the wedding friendly condominiums and hotels on the Gulf of Mexico and have your ceremony there or enjoy one of the public access areas. 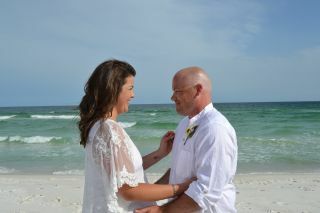 We will come to you for your Pensacola Beach wedding.